Examine the condition of the ewe's teat and udder. If the udder is hard or red and inflamed, it may have mastitis. If this is the case, feed the newborn lamb from a bottle and consult a veterinarian for help as the ewe will need medication. 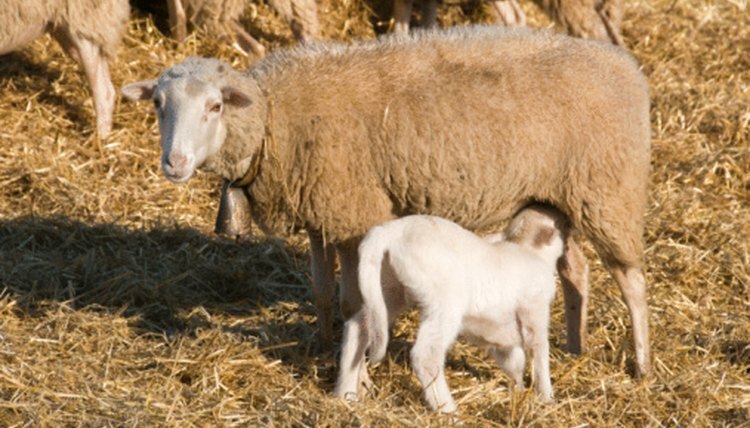 The teats of ewes, or female sheep, develop plugs of a wax-like substance that prevent bacteria and dirt from getting into them while they are pregnant. The teat or udder fills up with milk in preparation for the lamb and will distend, getting longer so that the baby lambs can nurse. After a lamb has been born, the baby must have its umbilical cord cut and dipped in iodine. Once you have taken care of the newborn lamb, you will then have to strip the wax from the mother ewe's teats and get them to produce milk. Have the ewe sit on its rump and either stand over it and hold it in place with your knees or have an assistant hold her still for you. Start to strip the waxy plug out of the ewe's teats so that the newborn lamb can nurse by gently gripping the top of the teat where it starts to join the udder with your hand. Pull down while applying even pressure with your hand to force the wax plug to begin to move out of the teat. When you reach the bottom of the teat move your hand back up to the top and start to pull down once more. Continue pulling on the teat in a milking motion, squeezing as you move your hand downward until the wax plug is removed and you get a squirt of colostrum, or first milk, from the ewe's teat. Colustrum is thick and yellow. It is rich in protein, vitamins, minerals and contains maternal antibodies, all of which are vital to a newborn lamb's survival. Repeat this process to strip the wax plug from the ewe's other teat.